Wildcat's matte Light Blue raffia matches our Aquamarine photo boxes perfectly. It's made of quality rayon (not paper). Matte finish raffia on a roll gives a natural look with a smooth, flat color that looks great on any package. 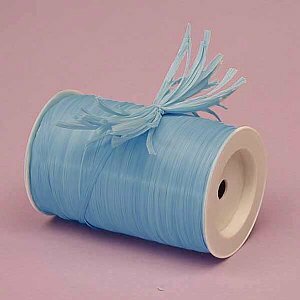 Raffia comes in a twisted together strand 1/4" in width, which can be pulled apart to expand to 1 1/4" in width for nice looking bows. 100 yd (300 ft.) per spool.